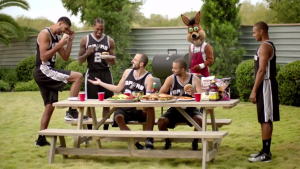 The NBA's San Antonio Spurs star players: Tim Duncan, Manu Ginobili, Kawhi Leonard, Patty Mills, and Tony Parker are the faces of this series or humorous commercials for grocery chain H-E-B. The ads were created by The Richards Group which includes four :30 ads: “Barbie,” “Wise,” “Slogans,” and “Toga”. This is Duncans 10th year appearing in the annual spots, according to HEB Group VP, Cory Basso the guys clicked so well during filming that all four ads were done in 5 hours. The Spurs are grilling up H-E-B Specialty Burgers, including the brisket burger, blue cheese burger and the salmon burger. The guys try to get Patty Mills to say a famous Australian saying in the "Barbie" commercial. Tim Duncan finds his teammates have gone Greek after trying H-E-B 100 Calorie Greek Yogurt in the "Toga" spot. The Spurs are coming up with new slogans for H-E-B Creamy Creations Ice Cream. Kawhi has an indubitably good slogan for his flavor.